Things have gotten relatively quiet on the 3DS front as of late, but a welcome trickle of first-party titles has been giving us more than enough reason to keep our portable machines close by in recent months. One 3DS title still on the horizon is Mario & Luigi: Bowser's Inside Story + Bowser Jr.'s Journey, which was actually first revealed back in March; we haven't heard a great deal about it since then, but a new batch of gameplay videos have now found their way online. The videos come courtesy of a new Japanese website for the game which features information, screenshots and more about what you can expect to enjoy when playing as your favourite Mario stars. It launches in Japan first, on 27th December, so it makes sense that Nintendo's home region is making more fuss about it than elsewhere at present. The new videos are pretty short, but all show off various tricks you can pull off in battles. Check them out below. In case you need reminding, Mario & Luigi: Bowser's Inside Story + Bowser Jr.'s Journey will launch exclusively on 3DS in North America on 11th January 2019, and in Europe on 25th January. Have you been looking forward to this one? Do you still enjoy playing games on your 3DS regularly? Let us know with a comment. Seems so odd and counterproductive to remake a game that is already playable on 3DS via backwards compatibility. I can literally already play this game on my 3DS, albeit with simpler visuals (though arguably they have aged fairly well). This game has a special place in my heart. I might hold this game in a higher regard than what it actually is, but for me, this game did everything right and I excuse all of it flaws. Can't wait to buy this remaster. Most interested in the Junior’s Minions section, but that only seems like it will be a fraction of the game’s play value. After you play BIS, the magic from the first playthrough turns into the “where is the next bean/ other collectible” game. Really wish they brought this out for Switch but whatever I'm still getting it on 3DS. I won't be in a rush to play this one, to be honest. I’m gonna get this for nostalgia alone. I still have my copy of the original, but I wanna play it with updated graphics. The original was the first RPG I can remember playing! I don't think Nintendo has surpassed the creative gameplay design since they made this game. You are literally playing 2 games at once with 2 screens. 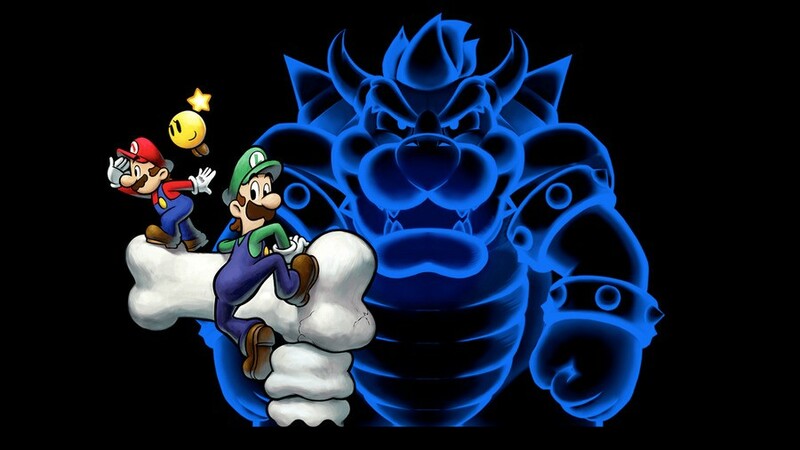 One is the outside world as Bowser, the other is Mario and Luigi inside Bowser's body. The interactions between the outside and inside world are filled with so many creative ideas. The LOL writing makes the game even more compelling. I want a Partners in Time remake. Im really looking forward too this. Why’d they skip Partners in Time? I have a soft spot for that one (and Superstar Saga, obviously). BiS came out when I was busy with college and I didn't get to play it. I guess this is my chance (or I'll just find the DS version used for way cheaper since it works on 3DS). @Toads-Friend I thought I was the only one. I was certain the Bowser Jr mode going hand in hand with a Bowser Jr amiibo was the only reason the existance of this port made any sense at all, and that it all-but confirmed the amiibo! Whoop! I'll pick this onre up for the nostalgia. I still have my original copy, but I never got past that one stupid required carrot minigame. The enitire thing feels like a roll of the dice. Hopefully they made that easier so I can beat it for once. On another note, I think I can explain was this was remade other than partners in time. Partners in time was pased off the gimic of the DS having 4 buttons, which the switch has. Bowser's inside story was based off the 2 screens, which the switch doesn't have. My best guess is that there will be a new mario and luigi on switch, followed by a remake of partners in time. @justin233 I expect they skipped Partners in Time because it wasn’t nearly as popularly-received as BIS. BIS would be more profitable especially since there might not be enough life left in 3DS to make two more M&L remakes. I’m looking forward to picking this one up because BIS is the only Mario and Luigi game I have not played/own. Let’s see what the hype is all about! This one is definitely on my radar, but I still need to pick up the Superstar Saga remake and play through it. I've never played the M&L series and feel that the best place to start is with the original. @iLikeUrAttitude Did you mean stick with the DS version? You said 3DS. Just pointing it out. Anyway, I do agree with you. I still have the game on the DS so I'm not excited about the re-release. Unless my copy breaks, of course, but it ain't likely as I take very good care of my physical games and consoles. @thesilverbrick Atlus did this several times. I dig it. 3DS allows the full artistic vision to be reached. Check out Radiant Historia that came out earlier this year. 3DS version looks amazing. @Trajan If anything, the graphical style used in the more recent Mario and Luigi RPGs won’t age as well as the pixel art from the GBA and DS era. They should’ve instead remade The Thousand Year Door or something else that can’t already be played on a 3DS. That would’ve pushed me (and likely others) into buying it. @thesilverbrick Twilight Princess was already playable on the Wii U through backward compatibility. And to some extent this is the case with many other games. I used to be an advocate remakes due to limited availability of Gamecube games at retail stores during the Wii U era, but to this day there are still dozens of Wii games found all over the place. You could easily find any first party Wii game for $20, and I find the SD graphics to vary negligibly to HD graphics compared to previous generational changes, so having all of these remakes for games that were released in the past 12 years just feel off. @Obito_Sigma Which is why Twilight Princess was a poor candidate for an HD remake, as well. Not to mention the game did not age well at all and the HD coat of paint only brought out its glaring visual flaws. @thesilverbrick Ive never played any of them, but looking at screen shots it should be fine. Good thing TP was brought up. Remember when everyone flipped out about Wind Wakers visual style? Now which one looks better? The more animated something is, the better it holds up really. Forgot this was a thing. I don’t really wanna dig my 3DS back out though. I’ll have to let this one pass. I love the 3ds and I love this game. Too bad Nintendo is lazy as #%^% for not using 3d in this game. I really love the pixel art in this game. I agree! I also enjoyed the parts where you had to turn the ds sideways. If they'd remade the game in HD for Switch, I'd have bought it in a heartbeat. Yeah I know I am beating a dead horse saying that, but that's the case. Even though I literally carried my 3DS around everywhere, daily, for like 6 years, it's sitting on my table, dusty, now. I will probably not go back to it until it feels nostalgic, like Game Boy and GBA do. I'm just thinking what everyone else already wrote. Honestly I just could not get into Inside Story at all, ended up abandoning it about halfway through when I realized that Bowser (both gameplay and writing-wise) was the only aspect I was enjoying at all. Bowser really needs his own game already. Not just "important co-star", but as the HEADLINER.